The public are being asked to make their opposition to the sale of the Whites Hill State College oval known, if there is to be any chance of saving it. With no clear consultation process however, there is the challenge to inform the public of the issue. 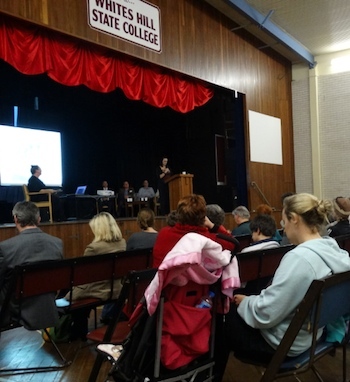 On the evening of Friday 14th June around 160 people gathered at the WHSC hall regarding the proposed sale of the oval by the State Government. The meeting, which was organised by the WHSC P&C, invited local representatives and the general public to attend. The audience was unanimous in its opposition to the sale. When asked for a show of hands from anyone in support of the sale, no hands were raised. Steve Minnikin the State Member for Chatsworth, Ian Kaye the State Member for Greenslopes and Kevin Rudd the Federal Member for Griffith were among the speakers. The two state members, whose electorates both run through the school land, assured the meeting attendees that they will take the community’s opposition to the oval sale back to the government. Carindale resident and parent at the school, Kerryn Loose-Jones, has been actively campaigning to stop the sale and outlined her key concerns here last month. She says she’s had no response to her several phone calls or emails to John-Paul Langbroek, the Queensland Minister for Education, Training & Employment. Mr Minnikin and Mr Kaye said they would follow up with him. At the time of publishing this post, Ms Loose-Jones has still not heard back from Mr Langbroek’s office. “We want our consultation and we want to know the timeframe for the potential sale of this land,” Ms Loose-Jones says. “We need to keep our community assets for the growth of our community,” she told the group. Mr Minnikin says that all residents against the sale must make their views heard. He said, at that point, only a few emails against the sale had been received by his and Mr Kaye’s office. “In terms of consultative process, things could have been a lot better. I freely acknowledge that,” Mr Minnikin said. “It’s not a done deal,” he explained. “It starts right now with each and every one of you. Everyone needs to get active,” he said. 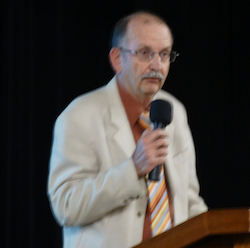 Mr Minnikin says he’s happy to “lobby” and be the “conduit” for the issue if there is enough support in the community. “It’s been my experience in 14 months, that not enough people actively get engaged with the political process,” Mr Minnikin said. Mr Kaye says an electorate office is too often used as a last resort when it should often be the first point of call. “As a local member, your job is to represent the views of your community,” Mr Kaye said. “There are a multitude of reasons that have been given for this, and I can see sense in some of them, but the views of the community are very important,” Mr Kaye said. Kevin Rudd’s Federal Seat of Griffith includes WHSC. He says that the increasing population of Brisbane and the local community’s use of green space are among key reasons to oppose the sale. 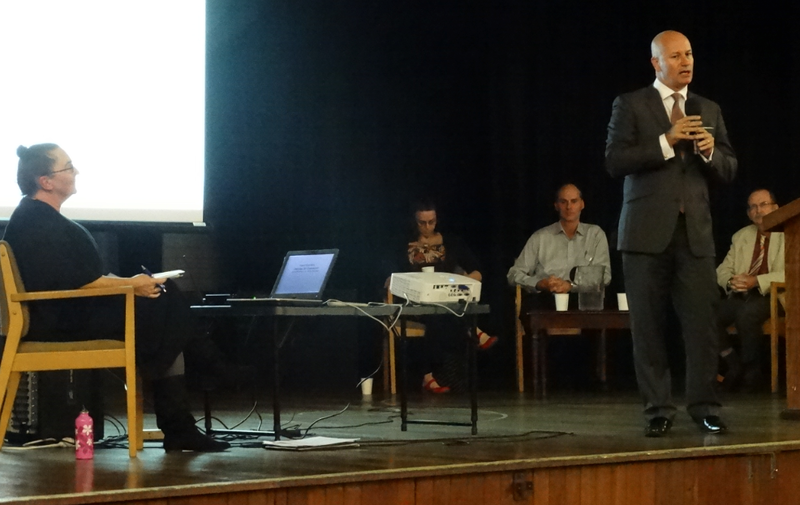 “The physical process of consultation with the community has been atrocious, just horrible,” Mr Rudd said. “The job of the community is to be vigilant. For God’s sake, get out there and use this opportunity to get out there and make your voice heard,” Mr Rudd urged. 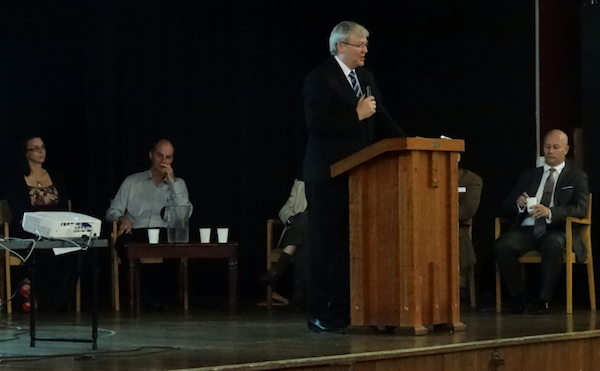 Kevin Rudd MP addresses the audience at the WHSC hall. Wayne Cameron of the Bulimba Creek Catchment Coordinating Committee (B4C) discussed both the community and the environmental importance of the land. “What we’re here for is it to speak up to a Government that appears willing to trade off our future community health and well-being by selling off public owned green space,” Mr Cameron said. “Every time a new government is elected they find a financial black hole left by their predecessors,” he said. Mr Cameron says the local community would not support the sale if it knew about it. “Brisbane is a pursuing a clean and green city in its local government planning – its 2026 council vision – that’s 40% natural habitat cover by 2026. So the proposed asset sales of lands are conflicting with the city’s planning objectives,” Mr Cameron said. Peter Lello, Vice President of the WHSC P&C, has been investigating the related processes and issues of the sale. He outlined concerns and said the P&C’s findings show the state decision to sell was “based on a limited economic analysis” and is “inconsistent” with policy or the Land Act‘s objectives. There were detailed presentations given by Mr Cameron and Mr Lello and we’ll aim to focus on their points, and those of others, further in future posts. If you want to provide us with any further information regarding the sale, I welcome you to email it to info@carindaleconnect.com.au or leave a comment at the end of this article.